During a kayaking trip just off the coast of New Zealand's Abel Tasman National Park, a pair of British vacationers got an unexpected up-close introduction--to a fur seal. New Zealand authorities recommend that people not get too close to fur seals, as they have been known to bite, but what happens when a fur seal gets too close to you? The seal hopped right up onto the kayaker's kayak, gave the tourists a sniff, glanced around, and hopped back into the water, continuing to swim around the kayak for a few minutes, according to an interview conducted by The Daily Mail. Fur seals aren't rare at all; they're common prey for oceanic predators like sharks, orcas, and even sea lions, which are substantially larger. 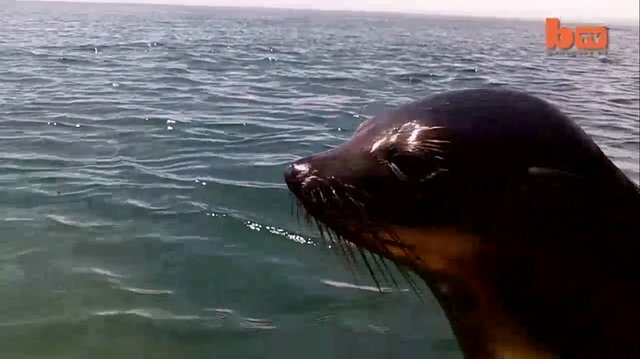 Seals often hop up on land to evade sharks and orcas, which can't follow them--it's likely that this particular seal sensed danger and saw a convenient escape route, albeit one already occupied by a couple of curious humans and a camera. You can see the video here.